Elevated Beds provide comfort off the floor and the breathable fabric helps regulate temperature. Maximum playtime allowed by the weather. We do not set limits on playtime like some facilities, but do provide adequate rest time especially during summer months. Varied styles of boarding depending on your dog’s temperament and comfort. Family dogs can stay together at reduced price (Save $20 per night). Additional services available such as Nightly Ice Cream, Treats, and go home bathes. Your pets get to enjoy communing with other dogs all during the day, and sleep separately at night. 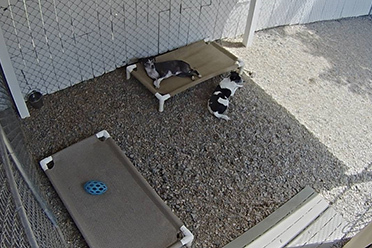 PURRfect Paws believes in social boarding because your pet should not have to sit in a cage all day. 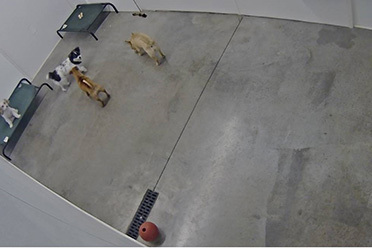 At 7 feet long, these kennels provide lots of room for pet to stretch his legs. Our large indoor suites are the ideal solution for multiple family dogs that can stay together overnight. The suite can easily accommodate two medium sized dogs and both would have their own elevated beds. If your pet is not comfortable around other dogs, Indoor/Outdoor Runs are purrfect. These suites feature a large indoor area with solid separation panels to avoid any direct contact from other visitors. The suite has door leading to a private and shaded outdoor area with plenty of room to enjoy the weather. Your pet will receive maximum comfort and security.